Tennessee shoppers from Chattanooga and beyond who are on the lookout for a capable, tough, and stylish pickup truck for daily driving or towing and hauling should look to the 2016 Toyota Tacoma. These impressive trucks are available now at Capital Toyota and offer city-friendly maneuverability and hefty pickup truck performance to help you take on all your towing, hauling, and everyday driving needs. No matter what kind of truck you are looking for; a plain-and-simple work truck, a mid-level crew cab truck for family outings, an off-road truck that is always ready to get dirty, or a fully-loaded luxury-grade pickup packed with every convenience and comfort, the new Toyota Tacoma can and will fit the bill. Drivers from Jasper, Cleveland Ooltewah, and Signal Mountain, TN come to Capital Toyota in Chattanooga to shop our impressive selection of new Tacoma trucks for sale - and you can too! We are located at 5808 Lee Highway in Chattanooga, just a short drive away from many Tennessee communities, so come and see us today and find your next favorite truck! A Toyota Tacoma is waiting for you! The 2016 Toyota Tacoma is one of the most popular models in the mid-size pickup segment. Rivals like the Nissan Frontier try to imitate, but always fall flat. The 2016 Toyota Tacoma had received a host of changes for the new model year that help it further compete with rivals like the 2016 Nissan Frontier. Toyota's popular midsize pickup truck was given some fresh, new exterior styling, a brand new V6 powertrain, upgraded interior materials and finishes, a long list of new features, a new, more capable drivetrain; and even more off-roading features in both its TRD Pro trim and its road-minded trims. Thanks to the laundry list of new features and amenities, the 2016 Tacoma shines even brighter in the midsize pickup truck segment than it did in previous model years. The 2016 Toyota Tacoma pickup comes with one of two engines to provide you with the ability to equip your vehicle in the way that best fits your driving, towing, and hauling needs. The base Toyota Tacoma comes with a 2.7-liter four-cylinder engine that makes 159 horsepower and 180 pound-feet. of torque; the upgraded engine option is a 3.5-liter V6 that produces 278 horsepower and 265 pound-feet of torque. The V6 engine is an Atkinson-cycle model, a first for the Tacoma lineup, that also features Variable Valve Timing-intelligent Wide and Variable Valve Timing with Intelligence technology in order to improve fuel economy across a wide number of driving situations. If you are looking for a midsize pickup truck that can tackle a wide range of different driving situations both on-road and off-road, then the 2016 Tacoma is a great option that will serve you faithfully - so you can forget about the Nissan Frontier. While the 2016 Frontier also has two engines available, the Tacoma's are more powerful. The Nissan Frontier's base engine is a 2.5-liter four-cylinder that produces 152 horsepower and 171 pound-feet of torque. 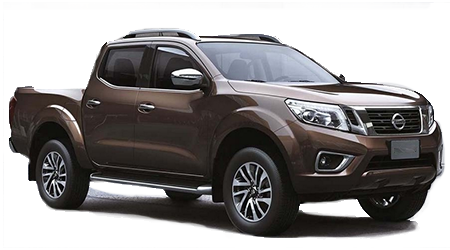 The Nissan Frontier's V6 is a 4.0-liter model that produces 261 horsepower and 281 pound-feet of torque. The Frontier's V6 might produce a little more torque, but the Tacoma's V6 (with the available tow package) can pull harder; it's rated for a maximum towing capacity of up to 6,800 pounds while the Nissan Frontier's V6 tops out at 6,500 pounds of maximum towing capacity. When compared to the 2016 Nissan Frontier, the Toyota Tacoma is much newer in terms of design and features thanks to the upgrades it got for the 2016 model year. In its 2016 model iteration, the Tacoma comes loaded with interior features like the Toyota Entune multimedia system (which features a 6.1-inch touchscreen display, six speakers, AM/FM/CD player stereo, auxiliary and USB ports with IPod connectivity, advanced voice recognition, Bluetooth, Siri Eyes Free, an integrated rearview camera, and more, depending on the trim you select), adjustable (power adjustable in some models) drivers and passenger seats with lumbar support, a leather-trimmed steering wheel with audio and Bluetooth controls, remote keyless entry (or a Smart Key system with push-button ignition; automatic transmission only), and more. The base Nissan Frontier is not available with a rearview camera (and entry-level V6 models only offer it as an option), and Bluetooth, power locks, power windows, remote entry, adjustable front seats, and a leather-trimmed steering wheel do not come standard on the base Frontier either. The 2016 Toyota Tacoma is a much better value, even in its base trim, than the Nissan Frontier. Come to Capital Toyota to see the difference that 2016 Tacoma makes! When utilizing a midsize pickup truck on a regular basis, the last thing you want to worry about is your safety. To provide you with the peace of mind to enjoy driving the pickup truck on a regular basis, Toyota packed the vehicle with a lengthy list of safety features to keep you protected at all times and in the case of an accident. Safety features on the new Tacoma include the Star Safety System with Smart Stop Technology, Brake Assist, Electronic Brake-force Distribution, four-wheel anti-lock brakes, Traction Control, and Vehicle Stability Control; Downhill Assist Control, Hill Start Assist Control, a Tire Pressure Monitor System (TPMS), advanced air bags, driver and front passenger active headrests, LATCH child seat anchor locations in the rear outboard seats, and an engine immobilizer security system. The base Nissan Frontier pickup truck does not come with a standard security system or an inclusive bundle of safety features like the Toyota Star Safety System. Pick the 2016 Toyota Tacoma for your family's pickup truck needs and you will always feel secure on the roads - or off of them. After exploring the new Tacoma at Capital Toyota, you might want to bring one of these impressive truck home to your own garage. Do so with confidence thanks to Toyota's amazing warranty package that comes with every new Toyota, including the 2016 Tacoma. You won't have to worry about problems arising during your initial years of ownership, because your Tacoma is backed by a first-rate factory warranty. Every Tacoma is protected for 5-years or 60,000 miles under the limited powertrain and drivetrain warranties, as well as for 3-years or 36,000 miles under the basic new car bumper-to-bumper warranty, which covers all components and systems other than those affected by normal use (tires, oil, filters, wiper blades, etc). The 2016 Tacoma also comes with the ToyotaCare no-coat maintenance and roadside assistance plan for 2-years or 25,000 miles. The Nissan Frontier does not offer a comparable scheduled maintenance package or roadside assistance plan. Drive with confidence in a Toyota Tacoma. When it is time for a new truck, head to Capital Toyota in Chattanooga and explore our selection of Toyota Tacoma pickups. These exceptional trucks stand heads and shoulders above competitors like the Nissan Frontier that just cannot keep up with Toyota's innovative powertrains, luxury-grade quality, and innovative in-car technology. Come and explore the new Tacoma for sale near Cleveland, Signal Mountain, Jasper, and Ooltewah, TN at Capital Toyota.